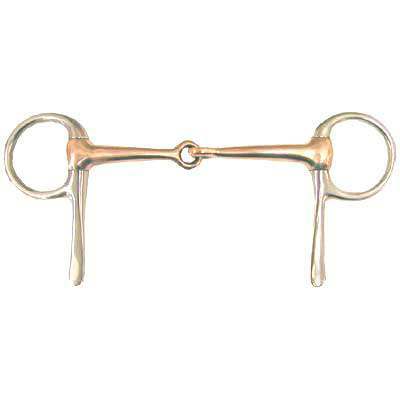 Every new Mini Half Cheek Copper Mouth Driving Bit offered by Horse Tack Now is professionally made and goes through a stringent quality control team that makes sure you only receive the greatest quality product. Horse Tack Now is an online horse tack store specializing in Horse Bits and many other premium horse tack products. This item comes with a copper mouth which will help with the horses salivation. The shanks in this item are also made of solid stainless steel which is very durable and will last a lifetime. The Mini Driving Bit that we offer is especially made for ponies. All of our products are ins tock and ready to ship out. Take advantage of our low discount prices. I ordered 2 of these bits, as I wanted a full copper mouth piece. When I finally got the item, I was quite surprised and disappointed to see the bits I received are not the same ones I ordered, or as advertised. Instead it is a silver bit with a small copper section, and different hinges. It can be seen at national bridle dot com product 1-6817. I placed a call advising of the problem, and have yet to hear back. They look to be nice bits, but not what I wanted, nor what I thought what I was ordering.